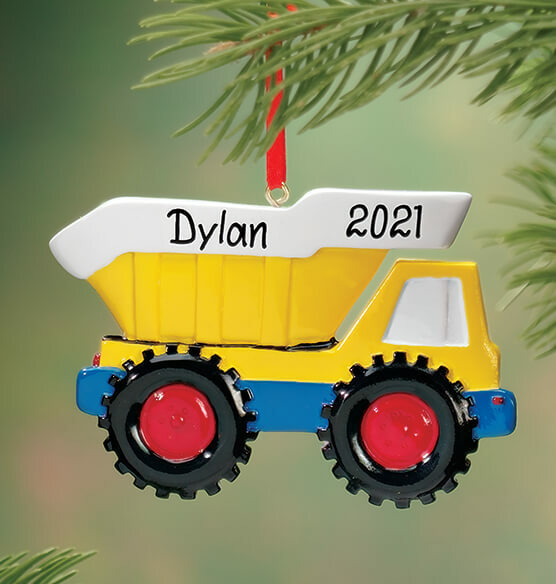 This personalized dump truck ornament is a rugged rig! Dump truck ornament delivers holiday fun for your little driver! Bright, construction-inspired resin truck ornament is 4" long x 1/4" wide x 2 1/2" high. Specify name; limit 1 line, 14 letters/spaces. Specify year; limit 4 characters. Colorful resin. My son loves dump trucks! This caught my eye as the perfect ornament for my two year old nephew who loves all vehicles right now.